Multiplication is one of the most difficult concepts for young children to master. Unless it involves very small numbers like 2×2, it is an abstract concept that is difficult to visualize. It involves new rules, memorization and the ability to work quickly. The timed multiplication tests given in class can be intimidating for many students, causing unneeded stress and anxiety. One way that you can help your child prepare for quizzes and tests without stress is by giving them free printable worksheets to practice multiplication at home. Use these worksheets to work along with your child to help him or her master difficult math concepts. We also provide worksheets for other types of math as well, including addition, subtraction, division, fractions and more. Your child can work on these sheets at his or her own pace without worrying about timers, racing against other students or feeling the teacher peering over their shoulder. Teachers, group work often helps students who lag behind master difficult concepts. Even with as much training as you have, some things just don’t click until a friend or classmate explains them. By providing structured time for group work and these free printable multiplication worksheets, your students can practice multiplication together. When giving these to your students, be sure to set an amount of time for completion, but remind them that it isn’t a race to see who can finish first. This should prevent the overzealous students from completing all the work just to be the group that finishes first. Go around visiting with each group to ensure that all students are learning how to do their multiplication tables. After the worksheets are completed, review them in class and allow the students to ask questions about any difficult problems they may have missed. As they say, start at the beginning! When it comes to multiplication, that means starting with the free printable One (1) times table. We have the perfect worksheet for you to introduce this new math skill to your students. 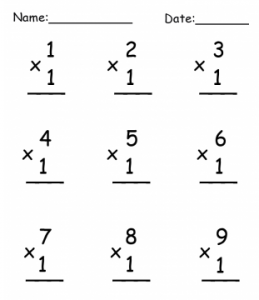 The top numbers of the multiplication problems number 1 through 9. All of these numbers are multiplied by one so students can easily see that a number multiplied by one is that number. The worksheet is very easy to complete because it’s not intimidating or overwhelming. It consists of only nine problems with large numbers and plenty of whitespace for working. Multiplication is the foundation for all other types of math that follow, so it is important that students grasp these concepts early on to avoid falling behind. Providing plenty of practice multiplication problems ensures that they continue honing their skills. These worksheets can be completed in the classroom or sent home with the students as homework to complete with help from their parents. Encourage parents to use real life objects whenever possible because young children master multiplication better with visual aids.